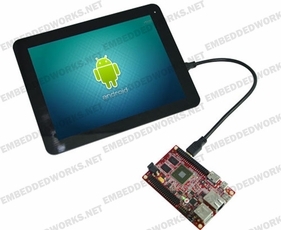 LCD8000-97C is designed by Embest to provide a LVDS interface to allow the MarS Board & SABRE Lite to connect with a 9.7-inch LCD module with capacitive touch screen. The resolution of the 9.7-inch LCD Module is up to 1024x768 with 256000 colors. It also provides multi-touch technology for you to have an excellent touch experience in the MarS Board Super ARM DIY Platform and SABRE Lite.